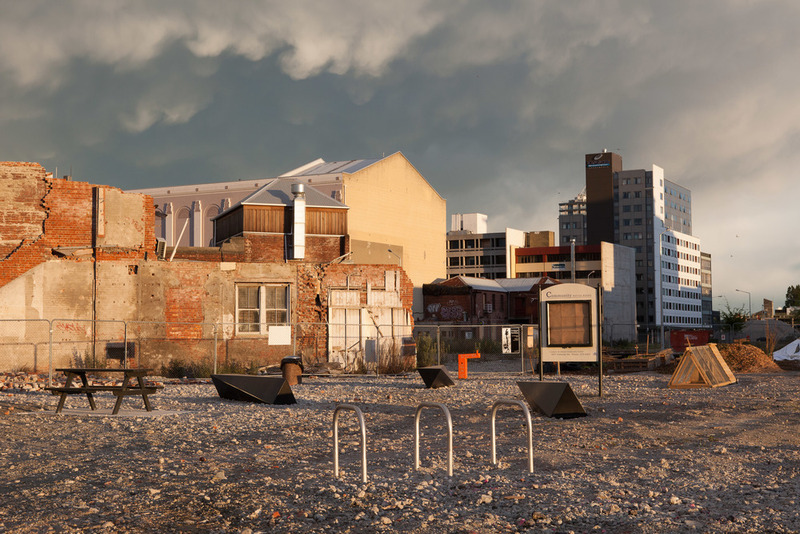 Fiona Connor looks at the way functional objects, such as rubbish bins and park gates, have become much more visible in post-earthquake Christchurch. By drawing attention to their sculptural qualities in her SCAPE 7 work, she invites us to consider the way they are used to create space and specific environments. Fiona Connor’s installations typically present collections of objects or structures that have been derived, at one-to-one scale, from pre-existing architectural systems. Recent projects have documented vernacular structures from outside the gallery, while others have explored the architecture and display mechanisms of the museum itself. Within a sustained dialogue between location and representation, Connor’s work explores how specific environments condition our perception of objects. Completing her Bachelor of Fine Arts and Bachelor of Arts at the Elam School of Fine Arts at the University of Auckland in 2004, Connor has also studied at the University of California in San Diego and the University of Barcelona. She recently completed her Master of Fine Arts at the California Institute of the Arts (CalArts) in Los Angeles. She has held recent solo exhibitions in Auckland, Dunedin and Los Angeles. Connor’s work has been shown in group exhibitions throughout New Zealand and internationally, including: Made in L.A., Hammer Museum, Los Angeles, 2012; Prospect: New Zealand Art Now, City Gallery Wellington, 2011; De-Building, Christchurch Art Gallery Te Puna o Waiwhetu, 2011; On Forgery: is one thing better than another?, LAXART, Los Angeles, 2011, and NEW10, Australian Centre for Contemporary Art (ACCA), Melbourne, 2010. In 2011 Connor received an Award for Patronage donation from Chartwell Trust and the Arts Foundation of New Zealand, and in 2010 she was a finalist in the Walters Prize. Connor was also a founding member of two of Auckland’s artist-run spaces: Special and Gambia Castle. Fiona Connor is represented by Hopkinson Mossman, Auckland.